The handsome chestnut Saraband was one of the fabulous four colts -- the others were Ormonde, Minting, and The Bard -- born in 1883 that made for such good racing in England in 1885 and 1886, long-remembered as a high point in turf history. A superior juvenile, and useful at age three, he was among the top ten leading sires in Great Britain for most of his stud career there, and in Germany was leading sire twice, largely based on the successes of his juvenile winners. His sons were useless in the stud, except for QUICKMARCH, who was a champion sire in South Africa, but seeing mostly half-bred mares he left little lasting mark. Saraband's daughters, however, bringing speed and precocity to their foals, had an important influence on thoroughbred breeding, with classic winners within the first two generations in England, Germany, France and the U.S.
His sire, Muncaster (1877), bred by Hugh Lupus Grosvenor, the Duke of Westminster, at his Eaton Stud, was a speedy son of Doncaster, and out of the Duke's good broodmare, Windermere, a Macaroni daughter. Windermere, bred at the Sledmere Stud in Yorkshire, was a sister to Middle Park Plate winner Frivolity, and half-sister to Polly Agnes (second dam of Ormonde, etc. ), Tiger Lily (dam of Martagon), and to Manchester Cup winner Little Agnes. Sold as a yearling in 1871, Windermere won Newmarket's Filly Stakes as a juvenile, and at age three was third to Cecilia in the One Thousand Guineas. 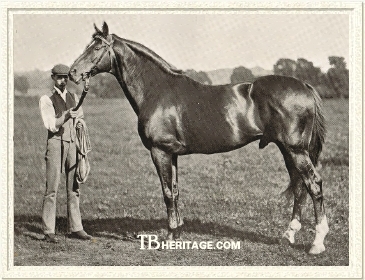 As a broodmare at Eaton Windermere also produced Kendal (by the Duke's great chestnut Bend Or), a superior juvenile and later sire of the English Triple Crown winner Galtee More; Kendal was twice leading sire in Ireland, a leading sire in Great Britain, and later a leading sire in Argentina, where he also did good service as a broodmare sire. Windermere also produced the fillies Golden Agnes (1885) and Rydal (1886), both by Bend Or, both good broodmares, and Muncaster's sister Thirlmere (1881), fourth dam of the great steeplechaser Golden Miller. Muncaster was a "grand solid chestnut, dark liver, a high crest and great round quarters that were dappled with gleams of gold through the brown." He had "the peculiarity of a short angle from the shoulder point to the forearm, which placed his forelegs rather in front of him, giving a slightly 'stilty' look, which is often characteristic of Muncaster's stock. But the shoulder itself made a big sweep back, placing the riding weight far behind the knees." Muncaster was heavily engaged to race as a juvenile, but he was a big, growthy colt -- at age three when he came out for the Guineas, "there was much joking about his gigantic appearance" -- and the Duke had the future Derby winner Bend Or in the same crop, so Muncaster was left to schooling until age three. He was trained, as were Bend Or, and their sire, Doncaster, by Robert Peck at Russley Park in Wiltshire. His career on the turf was brief. He won his first start, the second year of the Ascot Triennial, beating seven. In the Two Thousand Guineas Stakes, with seventeen runners, he was edged out at the finish by the Duke of Beaufort's Petronel, by three-quarters of a length. He was unplaced in the nineteen-horse field in Bend Or's Derby, and that was it for Muncaster on the turf. As a stallion for his trainer, Robert Peck, at W.J. Dore's Bishopstone Stud, Berkshire, Muncaster was more than useful, getting mostly precocious juveniles and fast horses with limited staying powers. Like his turf career, his stud career was short; he died at age twelve. He was generally among the top twenty leading sires, beginning in 1885 (ninth on the list due largely to Saraband's juvenile wins) and continuing to 1892 (eleventh on the list), three years after his death in 1889 from a heart attack while being shod. Just prior to Muncaster's death, Peck had been offered -- and turned down -- £10,000 for the horse. Saraband was Muncaster's best racing and sire son. Muncaster's fillies were as good as his sons on the turf, and much more successful in the breeding shed. Of his sons, Day Dawn (1887, out of Revillon, by Cambuscan) won Ascot's Wokingham Stakes; Suspender (1889, from Garterless, by Knight of the Garter), "a big, powerful horse" standing 16.2 hands, was unbeaten in his only three races, won Newmarket's Fitzwilliam Plate and the Severals Plate at Newmarket as a juvenile, and at age three took Ascot's Royal Hunt Cup by four lengths in 1892, carrying the heavy weight (for a three-year-old) of 7 st.-10 lbs. (he hit his leg in this, ending his career on the turf); the 16 hand chestnut May Duke (1889, out of Mailbaum by Scottish Chief), was a good winner of five races in nine starts over all distances, from 6 furlongs (Newmarket's Crawfurd Plate, beating the flyers Woolsthorpe, Bumptious and Marvel) to two miles (the second year of Ascot's Triennial, giving away weight to the field). None of these, or any other sons, besides Saraband, were particularly successful as stallions, Suspender, at Harry McCalmont's Cheveley Park Lodge, was the best of the lot; he got some winners, including Union Jack (1900) a winner of Goodwood's Chesterfield Cup (1-1/4 miles); Argosy, a winner of Newmarket's Granby Plate, and a number of precocious juveniles. May Duke, who first stood a E.J. Keylock's Broome Manor at Swindon for 10 guineas, and the Muncaster sons, Geant and Bandmaster (1885), were sold to Argentina as stallions. Another Muncaster son, St. Symphorien (1885), got some "muscular" foals with "powerful quarters" in England, but few of any racing class, and was sold to the U.S., where he got a good runner in the gelded Nattie Bumppo (1902); a few of his British and American daughters bred on. Muncaster's daughters included Fair Lillian (1882, from Duchess of Albany by Pretender), a winner of three in eight starts at age three; Lady Muncaster (1884, out of Blue Light, by Rataplan), winner of six of her nine starts at age two, including the Seaton Delaval Stakes at Newcastle (top weight), the Winchester Foal Stakes (beating seven, top weight), York's Gimcrack Stakes, and Doncaster's Rous Plate, and two of her four races -- the Newcastle Gold Cup and the Kirkleatham Stakes -- at age three; Wrinkle (1886, from Jennie Winkle by Mr. Winkle), who took Goodwood's Nassau Stakes at age three; Lightfoot (out of Footlight, by Cremorne), winner of Kempton's Champion Nursery Handicap as a juvenile. The most immediately successful Muncaster broodmare daughter was the unraced Lady Loverule (1888, out of Nellie, by Hermit), whose son, St. Amant (1901, by St. Frusquin), won numerous high-class races, including the Two Thousand Guineas and Epsom Derby. Lady Muncaster was later the dam of Middle Park Plate winner Speedwell (1892, by Springfield). Lightfoot later produced Royal Lancer (1889, by Royal Hampton), a winner of Ascot's Rous Memorial Stakes and Goodwood's Sussex Stakes. Muncaster's daughter Mystery (1887, from Violetta by Hermit) was the dam of the good stayer Carlton Grange (1892, by Carlton), a winner of Doncaster's Great Yorkshire Handicap and the Goodwood Stakes (2 miles). Luck (1889, out of Fortuna, by Scottish Chief), produced Lucknow (1895, by St. Angelo), a winner of Doncaster's Portland Handicap. Ionia (1886, from La Lyre, by Mars) became the dam of Bridge (1896, by Deuce of Clubs), a sprinter that won Ascot's All-Aged Stakes and Wokingham Stakes. Some Muncaster daughters with more distant successful tail-female descendants included the following. Ashdown (1888, from Miss Maria, by Scottish Chief) became second dam of Jackdaw (1908), a winner of Ascot's Queen Alexandra Stakes and later a notable sire of jumpers. Touch-Me-Not (1887, out of Thistle, by Scottish Chief, and so half-sister to Triple Crown winner Common, St. Leger winner Throstle, etc. ), had some good winners descend from her, including One Thousand Guineas winner Witch Elm (1904, by Orme). Floranthe (1887, out of the top producer Palmflower, by the Palmer) also established a successful tail-female line with winners in Austria-Hungary, Sweden, Argentina, and Australia. Lalage (1885, out of Hermita, by Hermit) has descendants racing today; the American stakes winners Slewpy, Top Corsage and Croeso descend from her. Queen Bee (1884, from Acheron, by Hermit) also had a number of stakes winning descendants, including the excellent Chaucer son, Stedfast (1908) and Grand Prix de Paris winner Popof (1951). Rosy Brook (1883, from Oaks winner Gamos) won once and placed twice as a juvenile, her win the Rothamstead Stakes at Harpenden; she was another Muncaster daughter whose descendants have been stakes winners, primarily in Chile and Argentina. Saraband's dam, Highland Fling (1869), by Ascot Gold Cup winner Scottish Chief, was bred and raced by the wealthy Scottish sportsman James Merry, the owner of her sire. She was a better than useful juvenile winner of five races in thirteen starts, including Chester's Mostyn Stakes (beating eleven), Chester's Beaufort Biennial Stakes, Epsom's Stanley Stakes (beating twelve), Newcastle's Stephenson Biennial Stakes, York's Filly Sapling Stakes, and Doncaster's Clumber Plate, and placing second six times, never by more than a length and half behind, and usually much closer, including Ascot's Fern Hill Stakes (to Chopette), and Doncaster's Eglinton Stakes. At age three she won three times in seven starts, taking a walk-over for Goodwood's Zetland Stakes, winning a sweepstakes at Newmarket, and Shrewsbury's Great Shropshire Handicap (one mile, beating a huge field of twenty-one); the best she could do in the only classic race she entered was third to Reine and Derelict in the One Thousand Guineas (eleven ran). At age four she won once in five starts, taking Doncaster's Alexandra Plate (one mile, beating ten). She was basically a miler with a turn of speed, and if not top class, still a solid winner over big fields. Robert Peck, who was the last of a long line of trainers for Merry, having schooled Highland Fling and Doncaster for him, bought Highland Fling at the 1873 dispersal of Merry's breeding stock. Peck also purchased Doncaster, and sold him on to the Duke of Westminster, who became a patron of Peck's. When Peck left Russley for Newmarket in 1882 he moved his broodmares to W.J. Dore's Bishopstone Stud, where he already had Muncaster standing at stud. As a broodmare for Peck, Highland Fling was immediately successful and also, through her daughters, established several long-lived tail-female branches with numerous stakes winners. Her Doncaster daughter, Pretty Dance (1878) was second dam of July Cup winner Running Stream (1898, by Domino), who bred the Commando son, Ultimus, the Voter son Runnymede, and Matron Stakes winner Pebbles (by Ben Brush). Pretty Dance's sister, Merry Dance (1870), was the source of numerous good winners down to the present, including the American Ballot (by Voter), South African classic winners Appointment (1963) and Reaper (1934), the good French stayer and stallion Ossian (1906), the Prix de l'Arc de Triomphe winner Coronation (1946) and his classic-winning dam, Esmeralda (1930, by Tourbillon), and the Blushing Groom son Groom Dancer (1984). Highland Fling's 1881 filly, Superba, by Sterling, was an outstanding juvenile, winning seven races, including Newmarket's Chesterfield Stakes, Doncaster's Champagne Stakes, and Ascot's Rous Memorial Stakes. At age three she won the Sandown Derby, placing second to Busybody in the Epsom Oaks, and third to The Lambkin and Sandiway in Doncaster's St. Leger Stakes. Superba's son, Pride (1892, by Merry Hampton), a stayer, won Ascot's Gold Vase and Queen Alexandra Stakes, and her daughter, Lady Wrangler (1894, by Wisdom) was the dam of two daughters that carried her female line forward, which included two classic German winners and Land of Song (1911), a winner of the Irish Derby. In 1883 Highland Fling dropped her chestnut colt by Muncaster, Saraband. He was followed by another Sterling filly, Sublime (1885), later the dam of St. Armel (1898), a winner in France. In 1887 Tarantella, a sister to Saraband, was born. Unraced as a juvenile, she only had two starts at age three, placing third in maiden races at Lincoln and Leicester. Tarantella's female line descendants included classic winners in Ireland, Italy, Belgium, and Chile, and are still running today. Saraband was a handsome dark chestnut "with good legs and feet, clean and wiry...perhaps a tad upright, but not enough to tell against him." He was purchased as a yearling by Sir John Blundell Maple, a wealthy furniture store owner who had numerous horses racing, and won three classic races in the 1890s, one of them with Saraband's daughter, SIFFLEUSE. His Childwick Stud was at St. Albans, where he collected a nice band of broodmares, and he spent a lot of money on various stallions, such as Common, when their racing days were through. Saraband remained in training with Peck. 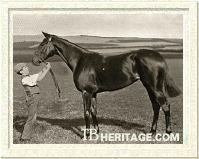 Saraband was a high-class juvenile that won six of his eight starts and the tidy sum of £6,338. He was a very speedy colt, a trait inherited from both his sire and dam. He debuted at Kempton Park's Great Breeders Produce Stakes, and blew the field of ten away, winning by twelve lengths. "It made one realize," said a turf writer, "the significance of the expression 'squandering the field.' I well remember Tom Cannon [a jockey aboard another colt] returning to the Paddock. 'I thought mine could go a bit,' he observed, as he slipped from his saddle, 'but that winner could have gone all round the course and caught me before I got home." At Ascot he won the Ascot Biennial easily, beating a field of seven other youngsters. A few days later he took Ascot's New Stakes, the most important juvenile event at the meet, winning easily by a length and beating Kendal, to whom he gave seven pounds, into second place. These two wins cemented his reputation as a top juvenile, although there were still many important events to come. He went on to Stockbridge to win the Hurstbourne Stakes by a length, beating St. Mirin and one other. Next was Kempton's Grand Two Year Old Stakes, with four runners, and he met his first defeat at the hands of Sunrise, a good filly early in the year, but the race was so close that Fred Archer, Saraband's jockey, thought he had won it; Sunrise's jockey Tom Cannon "just got up to win" through a "marvellously well-timed effort." Saraband went on to Goodwood, where he won the Rous Memorial Stakes, beating one opponent in a canter. At Lewes he won the Astley Stakes, beating two. After this he had several months of rest, and there were rumors he was having problems "in the wind." Then came the premier test, Newmarket's Middle Park Plate in the fall, run after 48 hours of steady rain on a boggy course. Nine ran in this race, and Saraband met the big colt Minting for the first time. Minting took the race by a neck, with a smart little filly, Braw Lass, doggedly hanging on for second, and Saraband a head behind in third. At the end of the season, the betting on the Derby of 1886 was on Ormonde, who had come on in the fall to win all his races, with Minting second favorite, Saraband a close third, and The Bard, another high-class juvenile, in fourth position. The 1886 season was long considered one of the best, with these four colts in contention, but in reference to Minting, Saraband, and The Bard, writers invariably include the phrase, "he had the misfortune to be born in the same year as Ormonde." Saraband's first outing that year was in the Two Thousand Guineas. Six ran, and Ormonde easily won, beating Mat Dawson's beloved Minting into second, with Saraband running fourth. Saraband did not run in Ormonde's Derby, and neither did Minting, who was sent to run in, and win, the Grand Prix de Paris, in France. Saraband went to Ascot, where he won the one mile Ascot Biennial by a length, beating five. A few days later he was in the Ascot Derby, where he was second to St. Mirin (receiving 8 pounds from Saraband), with five others in the field. His last race was the 1-1/4 mile Chesterfield Cup at Goodwood, where he beat fifteen others by 1-1/2 lengths. Saraband first retired to Bishopstone Stud, where he spent two years before going to Maple's Childwick Stud. In the spring of 1896, standing at a fee of 250 guineas at Childwick (Bend Or, Springfield, Minting, and Petrarch were all at 200 guineas), he was sold for £10,000 to Georg von Bleichröder, scion of a Berlin-based banking family, who was spending a lot of money in Erftstadt, Westphalia, to construct his new Gestüt Römerhof, a model of its time complete with a 2400 meter training track and elaborate, modern barns. He hired American trainer Fred Foster, who brought the jockeys Teddy Martin and Teddy Ross with him to get the stables off the ground, which they did most sucessfully. Saraband spent one more season, 1897, in England, with von Bleichröder offering a special 100 guineas stud fee to British breeders, before he left for his newly-built home, where he was installed as the principal stallion, and where he was leading sire in 1902 and 1903. Saraband was not unknown to German breeders; his British-bred daughter, ILSE (1890) had been imported into Germany and had been the champion earner in that country in both 1893 and 1894. Von Bleichröder did not have many years to enjoy his new breeding establishment. In 1902 he was killed in an automobile accident, surely among the first of casualties from that particular type of death in Germany. The government state stud at Graditz purchased Gestüt Römerhof in 1903, and operated it as one of its auxiliary stud farms until after World War I. The property later returned to private ownership. It is still operating today. Saraband continued as the principal stallion at Gestüt Römerhof until, suffering from "infirmities of old age," he was destroyed in the summer of 1907, age 24. In England Saraband first appeared on the leading sires list in 1892, where he was fifth, the highest he ever placed. That was the first year his old rival Minting was also on the list, in nineteenth place -- the champion of their generation, Ormonde, had made his appearance on the list, in 1891, and was third in 1892, but he was already long-gone to Argentina (and later to California). Despite the relatively few foals he left in England, Ormonde got Orme, the top juvenile of his year and later a leading sire in Great Britain, while Minting was a stud failure. The fourth member of that fabulous generation, The Bard, was at stud in France, where he would be leading sire twice -- in 1894 and 1901. Saraband remained in the top twenty on the sires list -- usually the top ten -- until 1897 (seventh on the list), when the last of his largest crops aged out of racing, his somewhat unrealistic stud fee in his latter years in England significantly reducing the number of foals produced. Not one of his sons ever made the top twenty on the sires list in Great Britain, although QUICKMARCH was a leading sire in South Africa. His British-bred daughters, however, were successful in the breeding shed, and none more so than ADMIRATION, the dam of the great Pretty Polly and her good siblings. TANZMEISTER (1889), who stood 15.3 hands, was from Mizpah, by Two Thousand Guineas winner Macgregor. Mizpah (1880), out of a daughter of the famous north country stayer Underhand, ran through age five, winning twice at the selling level in twenty-five races; she is known today as the second dam of Mahubah (1910), who produced the famous American runner and stallion Man o' War. TANZMEISTER was bred by E.J. Keylock at his Broome Manor Stud in Swindon and trained by John Charlton, winning £4,000 during his three seasons on the turf, facing some good competition, but not entered in many top races. He could compete at classic distances. TANZMEISTER won two of his six starts at age two, placing second twice and third once. He won Bath's Biennial Stakes by 3/4 of a length with eight in the field and also took Sandown's Michaelmas Stakes giving away weight, and was beaten by a half-length by Ormonde's son Goldfinch (in receipt of ten pounds from TANZMEISTER) in Kempton Park's Biennial Stakes, with thirteen youngsters running, and by Polyglot in Ascot's Triennial (with St. Damien, Sir Hugo and three others behind). At age three he took three races in nine starts, placed second three times, and third once. He won the second year of the Bath Biennial Stakes, with three running, Kempton Park's Biennial Stakes by 3/4 of a length, beating two others who were receiving weight from him, and Gatwick's Machell Stakes, again beating two others. He stepped up in class to run second in Ascot's Prince of Wales's Stakes (13 furlongs) with twelve runners, giving Watercress, the winner, ten pounds, with the good horses Pensioner, Dunure and Bona Vista behind him, and was also second (of two) by a length in Gatwick's Rothschild Stakes to the four-year-old Prince Hampton. He ran third in Doncaster's Great Yorkshire Handicap (1 mile-6 furlongs), beaten by the year-older horses Springtime (receiving 16 pounds from TANZMEISTER) and Petard (receiving 21 pounds), with fourteen in the field. He could not place in the Cambridgeshire, won by the excellent filly La Fleche, with Pensioner second. He came out once at age four, and ran unplaced, having hit his leg during the running of the Lincolnshire Handicap at Lincoln, won by Wolf's Crag. TANZMEISTER stood at Bishopstone Stud for fifteen guineas, and then moved to Keylock's Broome Manor Stud. IN 1902 he was sold to American trainer, owner and breeder Hiram Eugene Leigh, who at the time had a training stable at Swindon in England, and was exported to the U.S. He got some winners there, including Cherryola (1907, from Last Cherry by Sir Dixon), a very good race mare whose wins included the Latonia Autumn Inaugural Handicap, and later the dam of the beautiful, talented colt Purchase (1916, by Ormonde's California-bred son Ormondale), winner of the Saratoga Handicap, Dwyers Stakes, and many other good races. Another Saraband colt of 1889 was Maple's CLARENCE (out of Princess Arena, by Hampton). He was competitive at age three, winning the Lincolnshire Handicap (one mile, beating twenty-five), was second to Martagon in the two-mile Ascot Gold Vase, and third to Nunthorpe and Windgall in the Liverpool Summer Cup. Saraband's daughter SIFFLEUSE (1890, out of Assay, by Sterling), bred by Maple, was a fast filly that won the One Thousand Guineas and Yorkshire Oaks, and was second to Self Sacrifice in Doncaster's Park Hill Stakes. She was Saraband's only classic winner. She later produced Royal Summons (1898, by Royal Hampton), a winner of the Nassau Stakes, but the female line did not continue. SIFFLELUSE's sister, EIGHTEEN CARAT (1893) was sold by Maple at auction in France, where she was picked up by Maurice Ephrussi; she produced Champ d'Or (1902, by War Dance), who, in Germany, won the Zukunfts-Rennen. Champ d'Or's sister, Poudre d'Or (1903) continued the family line in France for a few generations. 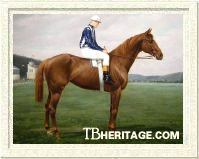 Worcester WORCESTER (1890, out of Elegance by Saunterer), a 15.3. hand liver-colored chestnut on the Muncaster mold, was a versatile weight-carrier that ran through age six. He was somewhat excitable, and, although "perfectly quiet" at home, when he got in the saddling and unsaddling enclosures at the racecourse he was wont to lash out with his hind feet, and periodically would refuse to run. His trainer, Joseph Cannon -- trainer of Oaks winner Bonny Jean, Meddler, the American colt Sir Martin, and other good ones -- maintained he would have been a "downright good one" had he been more even-tempered. He was bred and raced by James Best, at Holt Castle, a breeder with just a half dozen mares, and trained at Cannon's Lordship Farm. WORCESTER was purchased in 1896 by Barney Barnato, who had made a fortune from various investments in mines, collieries and other businesses in South Africa; Barnato was the uncle of J.B. Joel, who would buy Childwick Stud after Maple's death, where he became an extremely successful owner and breeder of racehorses. After his sale, WORCESTER was moved to trainer William Leader at Barcelona House in Wroughton. WORCESTER carried off some impressive wins, but they were spread over the course of his long career; he preferred a mile or less, but won up to 1-1/4 miles. He did not win as a juvenile, placing second to MILFORD in the Manchester Breeders Stakes, and fourth in Kempton Park's Great Breeders' Produce Stakes behind Tanderagee, Le Nicham and Minting Queen, giving all three weight, with eighteen in the field. At age three he won the Clarence and Avondale Stakes at Sandown Park in a canter, beating seven, including some four-year-olds, and was second to Cabin Boy in Gatwick's Golden Handicap, and second to Avington in Kempton Park's City of London Breeders' Stakes (one mile). At age four he did not place in his second run of the Clarence and Avondale Stakes, but at Goodwood he was second to GANGWAY in the Stewards' Cup, with twenty-one horses in the running, and at the same meeting he won Goodwood's Chesterfield Cup (1-1/4 miles), beating five, including Victor Wild, and at Derby he won the Peveril of the Pak Plate beating twelve others, including Hartfleur. He ended that season with a second at Manchester, beaten by half a length. At age five WORCESTER won three races in succession: the Doncaster Spring Handicap (one mile), carrying 9 stone, the Epsom Plate (worth 500 sovereigns) a seven furlong handicap, beating eight horses, and Ascot's Trial Stakes (Queen Anne Stakes, 7 furlongs) easily. Also at Ascot he was second to Woolsthorpe in the Queen's Stand Plate, with Best Man and two others behind, and was second again to Woolsthorpe in the July Cup (6 furlongs). The following year, 1896, he won five of his seven races for Barnato. He took Epsom's City and Suburban Handicap (1-1/4 miles) in a canter, with fifteen others in the field; Ascot's Trial Stakes for a second time, beating six; Newmarket's July Cup (6 furlongs, giving 17 pounds to the favored speedy filly Grig); and at Lewes won the Southdown Plate (6 furlongs), carrying 10 st.-5 lbs., beating three. He could not beat the weight in Stockbridge's Alington Plate (giving the winner, Dinna Forget, 19 pounds), or in Goodwood's Stewards' Cup, where he gave Chasseur 15 pounds. WORCESTER, inherited by J.B. Joel when his uncle died, stood at Theakston Hall Stud, alongside Winkfield, Tarporley, and Victor Wild, at Heath Stud Farm, and at Newmarket at 40 guineas. He got some winners, including Countermark (1900), a winner of the Craven Stakes at age two. MILFORD (1890, out of Colleen Bawn by Salvator) was a gift from the wealthy Scotsman George Alexander Baird, who trained his horses at Bedford Lodge, to his lover, the famous beauty Lily Langtry. MILFORD, who raced under Langtry's nom-de-course, "Mr. Jersey," was the first horse to run in her colors, and one of her better horses. A chestnut, he was described as a "remarkably handsome colt." MILFORD'S best season was as a juvenile, when he won five races, including the Royal Two-Year-Old Plate at Kempton, beating a really good filly, Minting Queen, and seven other good ones; Ascot's Coventry Stakes, beating the French horse Marly and three others; Newmarket's July Stakes, beating Bill of Portland and one other; Manchester's Breeders' Foal Plate, giving away 14 pounds to the runner-up; and placing second to Perigord in the Sandringham Gold Cup at Sandown, and handily beaten by Isinglass and Ravensbury in Newmarket's Middle Park Plate. At age three he won three times, including a walk-over at Nottingham, the Palace Plate at Alexandra Park, and a match against Lumberer. At four he won three races in sixteen starts. He was not a successful stallion. 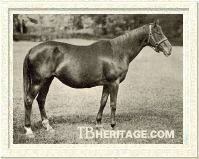 Another 1890 colt bred at Childwick by Maple was GANGWAY (from Gang Warily, by Sefton). He was best at distances under a mile. He ran second to Wolf's Crag in the 1893 Lincolnshire Handicap, and in 1894 won Goodwood's Stewards' Cup (6 furlongs), beating twenty-three others and the Newmarket Handicap, beating twenty, and was second to Indian Queen in the Cambridgeshire at Newmarket, giving her 21 pounds. He was a very modest sire in Britain, and in 1898 he was sold by Maple at Halbronn's in Paris, and was purchased for 500 guineas by a M. Falguiere. Two-time German champion Ilse preceded her sire to Germany Another youngster in Saraband's 1890 crop, ILSE (out of Little Sister, by Galopin), was purchased as a yearling and sent to Germany. She ran for Baron Hermann von Münchhausen, a Prussian military officer who had established an elaborate set of stables for his thoroughbreds in 1882 at his Bockstadt stud. Trained by William Dean, at age three ILSE'S eight wins included the Preis der Diana, beating six in a canter; Baden-Baden's Fürstenberg Rennen (2400 meters); Frankfurt's Alexander Rennen, and Frankfurt's Wäldchens-Rennen (2400 meters), placing second to Wahlstatt (by Flageolet) in the Deutsches St. Leger. Her earnings that year made her the champion runner in Germany. The next year she was also good, taking five races, including the rich Preis von Baden (8 ran, 2200 meters), the Hoppegarten's Staatspreis (First) Klasse, and the Wäldchens-Rennen for a second time. She was the champion earner in Germany again that year, 1894. ILSE later produced some winners, including Irmin (1899), by Hannibal, who was briefly owned by von Münchhausen. Irmin's wins included the Hoppegarten's the Wilamowitz Zucht-Rennen (1-1/2 miles). QUICKMARCH (1893, out of Marcia, by Marden) was, by all reports, similar in looks to Saraband, a chestnut with lots of white, long in the back and standing about 15.3 hands. He turned out in front, and was hard to keep sound, but nonetheless proved a very speedy, if not durable, racehorse. He was bred by Donald Fraser at Tichford Park. His dam, Marcia, was sold to France after he was weaned, and there produced Marcel and Maintenon (1901, by Le Sagittaire), the latter a record-breaking winner of thirteen of nineteen races in France -- including the Prix du Jockey Club, Prix Hocquart, Prix du President de la Republique, La Coupe d'Or, and almost all other important French races, and later a successful stallion (leading sire in France in 1917). QUICKMARCH was purchased as a yearling by South African magnate Sir Abe Bailey. In South Africa he won the South African Nursery, worth £400, in his first outing, dead-heated with Lord Ullin in a Johannesburg Autumn Handicap, won a Johannesburg Merchants' Handicap and a Johannesburg Brokers' Handicap (carrying 9 st-7 lbs. ), and was second to Lammas in a Johannesburg Winter Handicap and to Malgo in an Autumn Handicap at Turffontein. He was retired after two seasons, generally regarded as the fastest horse on the South African turf at distances under five furlongs. Sold to Alex L. Robertson, QUICKMARCH started his stud career at the famous Stormfontein Stud in Colesberg, and got a Merchants' Handicap winner, Gordian Knot, there, but the Boer War disrupted breeding, and after a few years he was repurchased by Bailey, who stood him at his Holle River Stud for a season. He was then sold to C.E. Tod who had a stud at East Griqualand, where he spent the rest of his life. He got numerous winners ("almost everything he got could gallop"), including a brilliant filly, Bella Donna II, the noted stayer Quickbriar, and "an army of high class ponies and galloways, who in those days played a much larger part on the South African turf." He was leading sire in South Africa in 1914 (posthumously), briefly breaking the hold the great Greatorex held on the sire's list, with a lot of good handicappers (but no classic winners), and placed highly on the list several other times. With relatively few full-bred offspring, he had no lasting influence on thoroughbred breeding in South Africa. The elegant chestnut BASS (1892) was bred by George Baird who had purchased her dam, Busybody (1881, by Petrarch), when the Falmouth Stud went on the block. Busybody was an excellent juvenile winner of Newmarket's Middle Park Plate and other races, and at age three took both the One Thousand Guineas and Epsom Oaks. BASS, a half-sister to Meddler and other good ones, did not get a name until after the age of three, and was known as "The Busybody Filly" in the racing calendar; she was picked up by trainer Alec Taylor for sportsman Hamar Bass. Her wins included Doncaster's Park Hill Stakes, beating Butterfly (winner of the Nassau and Coronation Stakes), Galeottia (One Thousand Guineas winner), Gas, and other good fillies. Sent to France, she later produced Belle Fleur (1903, by Flying Fox), a winner of the Prix Eclipse at Saint Cloud and a dam of winners, including Quai des Flelurs (1909), a winner of the Zukunfts-Rennen in Germany, and Le Traquet (1918), who won the Poule d'Essai des Poulains. ZARABANDA (1894, from Anthem, by Hermit) was owned in partnership by Lord Alington and Sir Frederick Johnstone, and trained by John Porter (trainer of the winners of 23 classic races, including the great Ormonde) at Kingsclere. She only ran four times at age two, but won Epsom's Stanley Stakes and Goodwood's Findon Stakes. She produced some foals for Alington, but her tail-female line did not continue. Another Saraband filly that was a winner in Germany, but bred in Great Britain, was VERSCHWIEGENHEIT (1894). She was out of the outstanding Rosicrucian daughter, Geheimniss, "the fastest filly I've ever seen," said her trainer, John Porter. Geheimniss won 20 of her 31 starts to age five, including an unbeaten juvenile season, and the Epsom Oaks at age three. In England Geheimniss produced eight foals, including WORD OF HONOUR (1892), by Saraband, a non-winner but dam of four daughters that bred on, including Honora (1907, by Gallinule), dam of six winners, including Lemnora (1918, by Lemberg), who took Doncaster's Champagne Stakes at two, the Newmarket Stakes and the Grand Prix de Paris, and Hakim (1927, by Friar Marcus), whose wins included Ascot's New Stakes. WORD OF HONOUR'S tail female line is still active, and contained numerous high class stakes winners. At age fourteen Geheimniss was sent to Germany, in foal to Saraband. VERSCHWIEGENHEIT was the Saraband foal. Running for her breeder Prince Heinrich zu Hohenlohe-Oehringen, in seven starts she won three races, including the Stuten Biennial, and placed three times, including second to Wolkenschieber in both Baden-Baden's Zukunfts-Rennen and the Ratibor-Rennen at age two. VERSCHWIEGENHEIT'S daughter by Tokio, Gestandis, won four races and later was the dam of five winnners: four classic winners in Germany and Austria-Hungary descended from her, including Duetsches Derby winner Uomo (1956, by Orator). In Germany Saraband was an immediate hit. He was leading sire in 1902 and 1903 with his von Bleichröder-bred offspring from Gestüt Römerhof. He got many juvenile winners, and most could win at 1-1/8 to 1-1/4 miles when older. His fillies were as good as his colts on the turf, and many were good producers. His most brilliant son in Germany was FAUST, out of the great matron Festa, but FAUST died before his stud career commenced, and none of Saraband's other sons proved of much use in the thoroughbred stud. Saraband's 1898 foals, whose dams were bred in England and shipped in foal to Germany, included three top juveniles of 1900 -- von Bleichröder's DAEDALUS (out of Diadem, by Ingomar), winner of the Ratibor-Rennen (beating six), and Baden Baden's Schwarzwald-Rennen (ten ran), and Prince Hohenlohe-Oehringen's two good youngsters, ZIRBELNUSS (out of imported Hazledell, by Hermit), who took the Hoppegarten's Renard-Rennen, and ZULEIKA (out of Mosque, by Pero Gomez), a winner of the Zukunfts-Rennen at Baden-Baden and the Sierstorpff-Renen (beating sixteen). ECCOLA (1899, out of imported La Cloche, by Hermit), bred at Gestüt Römerhof, was another good juvenile, taking the Hoppegarten's Renard-Rennen and the Hamburger Criterium (beating seven). Her wins at age three included the Preis der Diana (beating seven), and Frankfurt's Wäldchens-Rennen. She later produced Eccolo (1909, by Galtee More), a good winner up to 1-1/4 miles whose wins included Hanover's Jubiläums-Preis (1-1/8 miles) and Grosses Hannoversches Handicap. ECCOLA'S daughter, Eidechse (1910, by the Galtee More son, Hammurabi) produced Henckel-Rennen (Two Thousand Guineas) and Union-Rennen winner Effendi and Furstenberg Rennen winner Ehrenpreis. BARCAROLE (1900) was out of Bayolia, by Friar's Balsam, a half-sister to the Barcaldine brothers Winkfield and Morion, the latter a versatile winner of Ascot's Royal Hunt Cup and the Gold Cup. Bayolia was purchased after her modest juvenile year and sent to Germany, where she was bought by the Weinberg brothers of Gestüt Waldfried, rapidly developing into a major private stud farm with imported English mares. BARCAROLE won Köln's Preis des Winterfavoriten (Middle Park Plate equivalent) as a juvenile, but fell off in ability at age three. 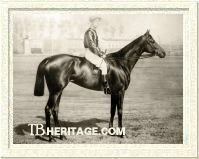 In 1907 the Weinbergs sent BARCAROLE to Major Eustace Loder's Eyrefield Lodge in Ireland to be bred to Laveno. Believed to be barren, she was put in the Newmarket July sales where she brought only 85 guineas from A. McMicking of Banbury, but there was a bonus when her unexpected colt Lavolt, ultimately a winner of five races, was born. She bred three more winners, including Jessica (1909, by Eager), a winner of five races and a reputation as one of the fastest fillies of her generation. As a broodmare for Lady James Douglas at her Harwood Paddocks, Jessica produced Bayuda (1916, by Bayardo), a good juvenile that won the Cheveley Park Stakes in a canter and went on to win the Epsom Oaks, and then placed second by a head in Liverpool's St. George Stakes to Rothesay Bay (giving two pounds), but blew a tendon in preparation for the Doncaster St. Leger. Bayuda's tail female descendants included the good juvenile Sharpen Up (1969), later a useful stallion, and Italian Derby winner Elgay (1975). FAMA, out of Alveole, by Crafton, was another Saraband filly from 1900. Her dam had been purchased in England for Gestüt Römerhof, where she would breed some excellent daughters for von Bleichröder and later for the state stud. FAMA won four times and placed four times in fourteen starts at ages two and three, including the important juvenile races the Renard-Rennen (beating six), the Hoppegarten's Ratibor-Rennen (beating six), and Köln's Rheinisches Zuchtrennen. FAMA produced ten winners of thirty-three races, including a series of good daughters at Gestüt Römerhof (by then operated by the state stud from Graditz). One of these was Flagge (1909, by Hannibal), a good juvenile that won Hoppegarten's Stuten-Biennial and other races, and at age three took the Henckel-Rennen (Two Thousand Guineas), the Goldene Peitsche, and the Großer Preis von Magdeburg, placing second to Einsicht in the Preis der Diana. 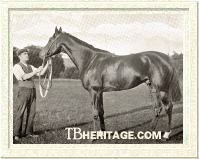 Flagge later bred some winners, including Freibeuter (1918, by Dark Ronald), a winner of Dortmund's Klönne-Rennen. FAMA'S family continued through Flagge's half-sister, Formosa (1919, by Dark Ronald); the half-siblings Firenze (1952, by Figaro), a winner of the Austria Preis, and Fanfar (1960, by Sunny Boy), a winner of the Deutsches Derby, were descendants of Formosa. Alveole also bred GAJUS (1901), a colt by Saraband, that won the Preis von Thüringen at Gotha and the Sierstorpff-Rennen. Alveole would later drop Antwort (1907, by Ard Patrick), one of Germany's most noted matrons. Two other juveniles that helped send Saraband to the top of the sire's list in 1903 were VISNUT (1901, out of Weisheit), a winner of Hoppegarten's Hertefeld-Rennen and Frankfurt's Alexander-Rennen for Gestüt Römerhof, and GIKA (1901, from Karikiri, by Fulmen), whose wins, also for Gestüt Römerhof, included Hoppegarten's Renard-Rennen, the Ratibor-Rennen (beating nine), and the Rheinisches Zuchtrennen (beating seven). GIKA'S dam also produced HUCKEBEIN (1902), who ran through age five, with numerous placings and some wins, including Baden-Baden's Damen-Preis in 1907. She also bred KAKADU (1903) for the state stud, a winner of the Schwarzwald-Rennen at Baden-Baden at age three, and the Grosser Preis von Leipzig and Munich's Bayernpreis at age four. Another 1902 Saraband foal, HABEMUS (1902, out of Bayreuth, by The Bard) was yet another good juvenile whose wins included the Hamburger Criterium (beating eight) and the Leipziger Stiftungs-Preis, and was second in Köln's Rheinisches Zucht-Rennen. HABEMUS'S female progeny persisted at Gestüt Römerhof for several generations, until one daughter was sold to Roumania, where a filly from her line, Hadina (1949) won the Premiui Dianei (Oaks equivalent). Saraband's 1903 crop included DALAND (1903, out of Gold Dream, by Bend Or), another winner of the Hamburger Criterium. In 1904 ANMUT (out of Angelure, by St. Angelo) was born at Gestüt Waldfried, a good racemare and another superior German matron that helped make Waldfried one of the most important studs in the country through the end of the 1930s. She was another Hamburger Criterium winner as a juvenile, also taking Frankfurt's Oktober-Preis für Zweijährge, and Köln's Rheinisches Zuchtrennen. At age three her wins included the Stuten-Biennial at the Hoppegarden, and was second to Alvo in Frankfurt's Alexander-Rennen. Reitred to Waldfried, ANMUT bred five winners, including Deutsches Derby winner Amorino (1913, by Festino); Henckel-Rennen (Two Thousand Guineas) winner Antinous (1912, by Festino); Anakreon (1918, by Fervor), whose wins included the Renard-Rennen and Hertefeld-Rennen; Auslese (1920, by Pergolese), winner of the Hoppegarten's Sierstorpff-Rennen, Oppenheim-Rennen, and Frankfurt's Oktober-Preis für Zweijährge at age two; Ausbund (1924, by Pergolese), who took Frankfurt's Jubiläums-Landgrafen-Rennen and the Hoppegarten's Oppenheim-Rennen, and ran second in both the Ratibor-Rennen and Furstenberg-Rennen (to Oleander). ANMUT's daughter, Augusta Charlotte (1915, by Fels), also produced two classic winners -- Deutsches Derby and Henckel-Rennen winner Augias (1920, by Pergolese), and Henckel-Rennen winner Aurelius (1923, by Pergolese), both of which also won top juvenile races. ANMUT's daughter Auslese bred several winners, including Preis der Diana winner Ausflucht (1930, by Fervor); Auslese's tail-female branch continues to the present. Faust FAUST (1905) was out of the British-bred Festa, that became one of Germany's most celebrated matrons. He was bred at Gestüt Waldfried, the stud of Arthur Weinberg, his dam's owner. FAUST won eight of his nine races, including the Hoppegarten's Renard-Rennen at age two; the prestigious Austria Preis at Vienna, the Grosser Preis von Baden, and Köln's Jubilaums-Preis zu Köln and Preis von Rhein at age three, when he was the champion runner in Germany, and the Goldene Peitsche at Hoppegarten at age four. He died from a twisted intestine before he could enter the stud. In addition to the notable Saraband daughters mentioned previously, there were several other mares, both in England and Germany, that were modest runners or unraced, but became important broodmares. Admiration ADMIRATION (1892) was out of Gaze (by Thuringian Prince, by Thormanby), who ran once without success at Warwick. Gaze was bought by Robert Peck who first bred her to Muncaster, and then to Saraband. Her first Saraband foal, MONTPENSIER (1891) was a minor winner for actress-celebrity Lily Langtry. Her next, a dark chestnut filly born in 1892, was sent to the Newmarket sales as a yearling, where she was purchased by Maj. Eustace Loder for 510 guineas; he named her ADMIRATION. She stood 15.3 hands, had "slightly drooping quarters, wide hips and most magnificent shoulder and long rein," the latter transmitted to her offspring. ADMIRATION (Family #14 - b), with her numerous high class descendants, is considered one of the most significant matrons in thoroughbred history. Loder served for fifteen years with the 12th Lancers, and had dabbled with steeplechasing in the 1890s, and then switched to flat racing. He purchased Eyrefield Lodge Stud near the Curragh in Ireland in 1897, and ADMIRATION was moved there after her career was over, along with a select group of other broodmares. ADMIRATION ran in both England, where Loder had estates in Sussex, and Ireland. She proved to be a most moderate race horse, winning twice in eighteen starts, placing second four times, and third three times. Although she started out in top company as a juvenile, running in Goodwood's Richmond Stakes and Sandown's Great Sapling Stakes (unplaced in both), Loder altered her career path afterwards, dropping her in class. At age three she took a second at Stockbridge, and then went to Ireland, where she won a £50 handicap over a mile at Baldoyle, and took a third at Leopardstown. At age four she won a six furlong handicap at Leopardstown, took three second places and two thirds in minor races. She ran once, unsuccessfully, at the Curragh at age five and then was retired. She bred nine winners from thirteen foals. Her best crosses were with the handsome dark chestnut Gallinule, who stood nearby at Brownstown Stud. ADMIRATION'S most famous foal was the great Pretty Polly (1901, by Gallinule), the winner of numerous stakes races, including the One Thousand Guineas, the Epsom Oaks, and the Doncaster St. Leger. Polly bred five daughters that continued her branch of Admiration's female line, with countless classic winners and good stallions in many countries. Polly's sister Adula (1902) won Doncaster's Park Hill Stakes, and her brother Admiral Hawke (1907), was an excellent juvenile winner of the Coventry Stakes and Criterion Stakes, and won Newmarket's Midsummer Stakes at age three, among other races worth more than £7,000; he was later sold to Germany as a stallion, but had little influence. 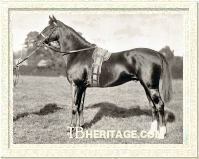 Adula and sisters Adora (1904) and Miranda (1905) all had stakes winning descendants. ADMIRATION'S daughter Veneration (1900, by Laveno) produced three top winners -- Craganour, Glorvina, and Nassovian -- and several of her daughters bred on with successful descendants. ADMIRATION'S daughter Miramonde (1908, by Desmond) also established a long-lived family, as did ADMIRATION'S daughter Addenda (1910, by Spearmint). ROUSSEAU'S DREAM (1893, out of Heloise, by Hermit) produced several winners, including Royal Dream (1903, by Persimmon), who won the two mile Goodwood Stakes at age three; his sister, Dreamy (1905), produced War Cloud (1915, by Polymelus), who was purchased in England by American A.K. Macomber and sent to the U.S., where he won the Preakness Stakes, the Dwyer Stakes, and the Walden Stakes, among other races. ROUSSEAU'S DREAM was also the second dam of Vertigern (1923, by Rossendale), a winner of New Zealand's Wellington Cup. One of her daughters, Sundream (1911, by Sundridge) established a branch that was successful in Australia. LA FIGLIA (1897, out of Vivandiere by Hampton) was bred by Lady Stamford, who owned Barcaldine as a stallion, and had bred a number of horses, including Primrose Dame, the dam of Perth. LA FIGLIA was sold to the Earl of Cadogan, a wealthy landowner, who was Viceroy of Ireland at the time, living "in semi-regal state" at Dublin Castle. LA FIGLIA, who ran in both Ireland and England, started four times as a juvenile, taking a third in a Nursery at Leopardstown. At age three she won four races. She dead-heated with Tim Hogan for the Trial Plate at the Curragh with seven in the field, won the Newbridge Handicap (twelve ran), Cork Park's Flying Plate (eleven runners), and Manchester's Thursday Plate, and placed second once, in seven starts. Her daughter, Carmen (1905, by Sidus), bred by Cadogan, was sold to France in 1910, and in 1920 produced Le Capucin (1920, by Nimbus), a genuine horse that won the Prix Lagrange and Prix Daru before taking the Prix du Jockey Club in an exciting come-from-behind run at age three. His other wins included the Prix Boiard and the Grand International d'Ostende. 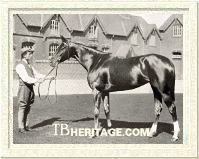 He was dam's sire of 1947 Epsom Derby winner Pearl Diver, and got other good broodmare daughters. FLIRT (1899, out of Favorit, by Ayrshire) won Köln's Preis vom Rhein for Eduard von Oppenheim, owner of Gestüt Schlenderhan, near Cologne. She later produced For Ever (1905) to the cover of von Oppenheim's stallion Saphir. For Ever's wins included the Preis der Winterfavoriten (Middle Park Plate equivalent) and the Alexander-Rennen at age two, and the Grosser Hansa Preis and Grosser Preis von Berlin at three. Saraband got number of other winners of lesser races, and broodmare daughters that produced winners, in both England and Germany. ©1997 - 2010 Thoroughbred Heritage. All rights reserved.